Mazda says the Sky-G provides better fuel economy than current comparable engines. 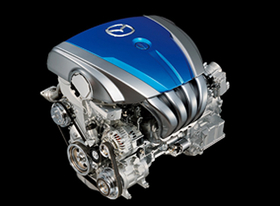 YOKOHAMA, Japan -- Mazda Motor Corp., which lacks its own hybrid and electric drivetrains, has unveiled a new generation of fuel-efficient engines that it hopes will keep its models competitive in an age of high-tech green vehicles. Mazda will introduce the engines, to be known as the Sky series, in 2011 as part of a push to boost the average fuel economy of its fleet 30 percent by 2015 from 2008 levels. The engines will consume less fuel and deliver higher torque, as a result of Mazda's re-engineering everything from compression ratios and combustion duration to intake volume. The four-cylinder, direct-injection Sky-G gasoline engine, offered in sizes ranging from 1.3 to 2.0 liters, will deliver 15 percent better fuel economy than current gasoline engines in the same class, Mazda said. The diesel version, the Sky-D, will get a 20 percent increase over today's offerings. Both will be mated to a new Sky-Drive six-speed automatic transmission. Limited by a relatively small r&d budget, Mazda has lacked the hybrid vehicle offerings of its rivals, such as the Honda Insight or Toyota Prius. And it also lags Nissan Motor Co. and Mitsubishi Motors Corp., which are both planning electric vehicles. So President Takashi Yamanouchi is betting on better combustion engines to keep Mazda in the game. Hayama wouldn't say which models will get the new engines first. Mazda showed a 1.3-liter Sky-D engine in the Kiyora concept car to be exhibited at next month's Tokyo auto show.